Biology in Science Fiction: Beware the Andromeda Strain! And now there was this machine. The machine would not, of course, give the precise order of amino acids. But it would give a rough percentage composition: so much valine, so much arginine, so much cystine and proline and leucine. And that, in turn, would give a great deal of information. Yet it was a short in the dark, this machine. Because they had no reason to believe that either the rock or the green organism was composed even partially of proteins. True, every living thing on earth had at least some proteins – but that didn't mean life elsewhere had to have it. For a moment, he tried to imagine life without proteins. It was almost impossible: on earth, proteins were part of the cell wall, and comprised all the enzymes known to man. And life without enzymes? Was that possible? Michael Crichton's The Andromeda Strain is a classic in biology-based science fiction. A military satellite crashes in the desert and, before it can be retrieved, almost every inhabitant of the nearby town has been killed by a deadly plague. It becomes clear that the satellite was carrying a virulent extraterrestrial microorganism. 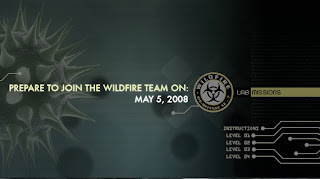 Much of the action revolves around a team of scientists in the secret "Wildfire" facility analyzing the microbes - the Andromeda strain - and trying to find a cure. After much experimentation, they finally determine that the Andromeda strain is like no life on Earth, since it's a crystalline organism that contains no proteins, DNA or other nucleic acids - and it can live on human blood! Of course there is more, including an action-packed race to prevent the self-destruction of the facility when the microbes turn to eating plastic. What's unique about the story is that the thriller action doesn't overshadow the lab work. At least that's how it seemed to me when I read the novel as an undergrad. The 1971 movie version of The Andromeda Strain kept much of the focus on the scientists. It included this somewhat disturbing scene of a rhesus monkey being "killed" (actually briefly asphyxiated with carbon dioxide). 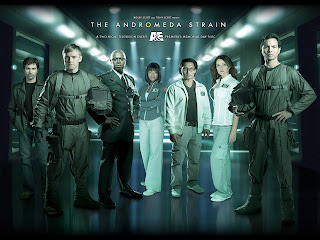 On Memorial Day (May 26) A&E will broadcast a new miniseries based on The Andromeda Strain* and produced by Ridley Scott. It stars Benjamin Bratt as Dr. Jeremy Stone, along with Christa Miller, Eric McCormack, Viola Davis, Daniel Dae Kim and Andre Braugher. The trailer certainly makes it look action packed. There will be a related game on the official web site* starting May 5. There aren't any details, but it looks like it will probably be interactive. Should we worry about a real-life Andromeda strain? While it seems unlikely to me that microbes adapted to living in cold and airless space would be able to thrive in the warm soup of the human body, there does appear to be a real potential threat from Earthly bacteria that travel with human astronauts. Salmonella bacteria flown aboard the space shuttle were shown to be more virulent when tested after upon their to earth (Pseudomonas and Candida carried on the same flight are still being analyzed). And even if the inside of spacecraft are sterile, it's possible that bacteria will be carried on the outside. Living Streptococcus bacteria were recovered from the camera of the Surveyor 3 probe after three frigid years on the moon. We may end up being our own worst enemy. * To see the Andromeda Strain web site extras, click Experience the Andromeda Strain on the sidebar. That pops up a Flash-based site that doesn't seem to want to load for me in Firefox, but works just fine in Safari.